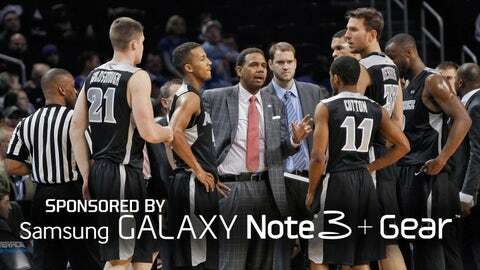 Last summer, Providence basketball coach Ed Cooley stepped on a scale, saw the No. "344," and finally decided to make the change that might some day save his life. Cooley had weight-loss surgery in July, put himself on a strict diet — starting with 400-calorie liquid days and, later, a strict 1,200-calorie maximum — and started working out. As a result, the Providence Journal reports, Cooley has lost more than 100 pounds in the past five months. His pants size, a hearty 50 when Cooley’s Friars were eliminated by Baylor in last season’s NIT quarterfinals, is now a much more healthful 38. Cooley’s problems with his weight date to his teenage years, with yo-yo dieting making it impossible to keep his waistline under control in high school and college. Once he got into coaching, Cooley says, things really went downhill. These days, Cooley has no qualms about downing a protein shake, but the chicken wings are out of the question — and his life and his family are better for it. • Derek Jeter reportedly does not allow photos inside his sprawling Florida mansion. • Milan Lucic got in a fight outside a Vancouver nightclub. • Meanwhile, Rudolph got his own baseball-reference.com page. • Bill Belichick’s girlfriend wears a "Ms. Belichick" jersey to Patriots games. • Actor John Goodman said he’s upset that Turner Field will be torn down. • Stevie Johnson played Sunday despite having learned of his mother’s passing on Saturday. • Ryan Freel was reportedly suffering from CTE when he took his own life last year. • Which NBA coaches are the best at drawing up plays during timeouts? • Ben Tate got his helmet stuck under the Texans bench Sunday. But don’t worry, he wasn’t wearing it at the time. • Jerome Simpson said an official at Sunday’s Vikings-Eagles game “said some questionable things” to a few Minnesota players. • If you like beer pong and air hockey, then you’ll love "alcohockey." • Sergio Garcia won a tournament this weekend with his girlfriend as his caddy. • Orlando Magic forward Glen Davis dislocated his shoulder Sunday, but had it popped back into place, then returned to the game.